A sphynx cat is a wonderful addition to many familes. They are very social, docile and loving, however; they do have some special requirements distinct to the breed. Please consider carefuly before making the decision to purchase a sphynx, will you be able to properly take care of their additional needs? Because the sphynx is a hairless breed, they do not have a coat, which means that the oils their skin produces stay on their skin, rather than going into their fur. Because of this, they do need to be bathed. I do not recommend bathing any more frequently than every two weeks, 6-8 weeks being optimal. The natural oils condition and provide the perfect PH balance. Washing them too often can lead to skin problems due to removal of their natural oils. I recommend a tear free baby shampoo (I use Noodle and Boo mixed with a small amount of Dawn dish soap to cut the oils). Surprisingly, our sphynx cats don't mind this process and some actually enjoy it (Mojo has been known to hop in the shower with us!) 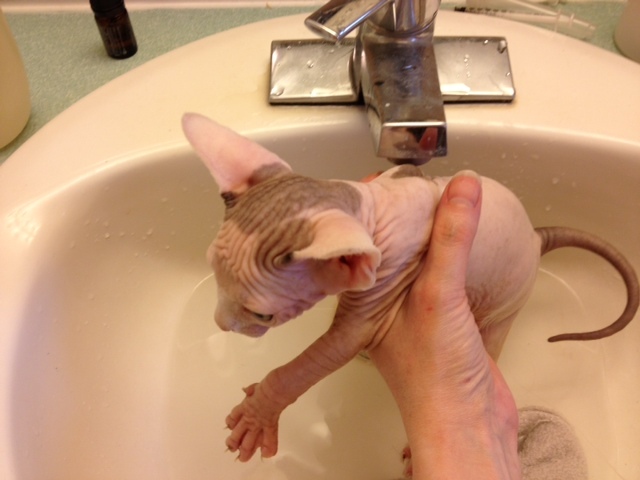 You can use sensitive, non scented baby wipes on your sphynx between baths if needed. I also provide fuzzy blankets for them, which can help remove excess oils and keeps them toasty warm. Also, even though the sphynx cat is a hairless breed, they are not hypoallergenic. Sphynx have a fine, soft coat of hair all over their bodies (they feel like a very warm, peach or chamoise.) If it's the hair you have an allergy to, you may be able to tolerate a sphynx, but; if it's the dander (saliva), you may still have an allergic reaction to this breed, although, it may be less severe because you can bathe them. My suggestion would be to come for a visit and see if you can handle being around the breed before making an obligation to purchase one. I have had some visitors have very severe reactions to sphynx. I WILL NOT REFUND ANY OF THE PURCHASE PRICE ON A KITTEN PURCHASED BY A FAMILY WHO ENDS UP BEING ALLERGIC. I will require surrender of the kitten and will handle re-homing of him/her. Please see the breeder's guarantee regarding my surrender policy. For this reason, I HIGHLY recommend that you schedule and follow through with a visit before commiting to the purchase of a sphynx, this includes placing a deposit. Several visits may be needed to ensure you or a family member is not allergic and determine if you can tolerate any reactions you may have to the animal. Sphynx have a very high metabolism. Because of this, they require a high calorie diet to maintain their body heat. The best source of nourishment for any cat is a canned or raw homemade diet, please see my page for information about feeding raw. I discourage feeding dry kibble as it is devoid of all water and contains fillers which are bad for your cat's digestion. Cats receive about 85% of all of their water, in the wild, from their food sources. When they are fed dry kibble, they get none of their water from it and are forced to drink more water to maintain their hydration, this is very hard on their kidneys and can lead to many health issues. I feed my cats twice a day, morning and night. They should be fed 4-6 oz per feeding, per cat. Again, due to the hairlessness of the breed, sphynx do not have the hair in their ears or their feet and they will get a waxy buildup inside their ears on on the nails. I recommend cleaning their ears with a gentle ear wash once a week to help reduce the possibility of yeast infections. my cats do not mind the drops. I use a few in each ear and a warm washcloth to wipe out the loose waxy buildup. You may also find that if your vet is not familiar with the breed, that they may think the animal has ear mites. I recommend the vet look at a sample under the microscope to verify that the kitten has mites, before treatment is administered. You should also clean their nails once a week after clipping using a soft cloth and mineral oil. Declawing is strictly forbidden in my contract. It is a major and unecessary surgery with negative consequences for the kitten. Instead, make certain the kitten/cat has adequate scratching posts in your home, redirect bad behaviors by spraying with a water bottle when they scratch in a bad area, and give treats for them scratching in an area that they are allowed to. Also, Soft Claws are a wonderful invention, I use them on my cats, they are easy to maintain, save wear and tear on our furniture (and us!) and they have great designer colors! Proper care should be taken to avoid plaque build up on your sphynx's teeth. You can provide raw chicken chunks as a snack which will help them keep their teeth clean and jaws healthy. You should also brush your cat's teeth once a week and schedule dental cleanings with your vet once a year and as needed. Sphynx kittens, like us, are for the most part, bald. If you are cold, chances are that your sphynx kitten is cold too. They are very resourceful and you may find them on your lap top, next to the heating vent, or under your covers. I recommend having at least one heating pad for your kitten and consider a sweater for the colder months. Sphynx should NEVER be allowed outside without supervision. They are very susceptable to temperature fluctuations and will become ill or succumb to extreme temperatures very quickly. They can also become sunburned. Care should be taken to avoid exposure to direct sunlight. Sunscreen, even for infants, should NEVER be used on a sphynx as many of the ingredients are poisonous to cats. Instead, invest in UV blocking shirts and hats for your sphynx.